Forum İstanbul 2017 has already started! Our President of Board Hasan Basri Kayakıran is at Forum Istanbul 2017. ​ Science, Industry and Technology Minister of Turkey Dr. Faruk was together with our CEO Hasan Basri Kayakıran on the “Competitive Sectors Program“. The order under energy efficiency Project, SQME200-800 extruder motor ready to go to Customer in USA. We presented our motors at WIN 2016. Our motors with high efficiency can elimate the need for the gearbox. Our sales are more than %65 exports, Germany, Iran, Italy, USA, China, Austria etc. We send our motors to China to be used in precision measurements by car test stands . ​Our president of Board Hasan Basri KAYAKIRAN is in America, in New York and in Boston for current and potential customer visit. We wereon the show with the GreenMotion "Smart Lift Energy Management System " @Inelex'16, dated April 07 - 10, in Izmir. Industry Minister Fikri Işık has visited our booth and said that these EMF Motor branded motors are very important for country's future for expanding the technologic export. We were @Izmir! We organized in Izmir the seminer "A Study on Standards EN 81-20 / 50 " to inform our turkish lift sector. 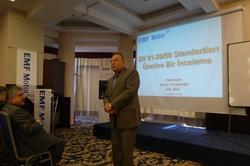 EMF motor organized a seminar about the EN 81-20 / 50 standards with Serdar Tavaslıoğlu, one of the leading names of the elevator industry, in Izmir Anemon Fair Hotel. Hasan Basri Kayakıran, the President of EMF Motor, started his speech celebrating the international Women's Day and annouched that this seminar in Izmir is the first one and they will continue to inform the lift sector in different cities. Omer Sınmaz, the Factory Director, made an introductory speech describing success stories of EMF Motor and innovations made in the factory. 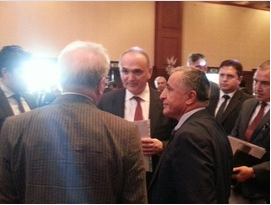 Serdar Tavaslıoğlu pointed that the TS-EN 81-1 / 2 standards are structured as TS-EN 81-20 / 50 Standards. The meeting was followed with great interest and took a full day.